As far as product launches go, this one wasn't very subtle. Just last week, HP's PR team widely disseminated a brief video teasing a wispy laptop called the Spectre. We couldn't parse too many details for all the shadows and quick-cuts, but we gathered this much: it seemed to be thin, and far too sleek to be just another business-centric Ultrabook. Nope, it would be arresting, bold and highly stylized. And this time, it would be meant for mainstream consumers. Well, folks: we were right (except for the thin part, anyway). 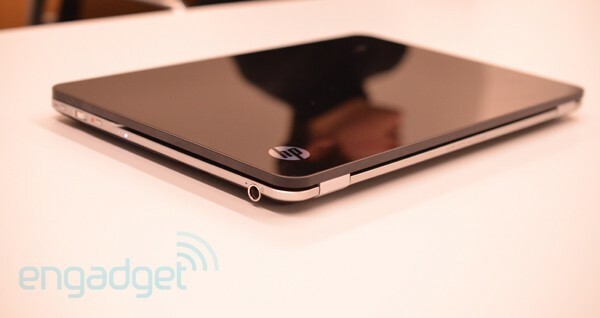 HP just unveiled the Envy 14 Spectre, and is billing it as a "premium Ultrabook." Which makes sense, since the laptop starts at $1,400, making it even pricier than the 13-inch MacBook Air (to say nothing of all those $900 ultraportables hitting the market). Above all, the company is justifying that price with a daring glass design, which HP insists makes the laptop more durable, not less so. In addition to cost, though, the trade-off to all that armor is some extra heft: the Spectre weighs in at 3.97 pounds and measures 20mm thick, making it the chubbiest 13-inch Ultrabook we've seen yet. So what does $1,400 get you, aside from a memorable design? We're told the laptop comes standard with a 14-inch, 1600 x 900 Radiance Display (hurrah! ), Core i5-2467M CPU, 4GB of RAM, a nine-hour battery, backlit keyboard, carrying case and -- get this -- an NFC chip built into the palm rest for transferring URLs from your phone's browser. Other bells and whistles include Intel Wireless Display, HP's CoolSense technology, Beats, HP Wireless Audio, full copies of Photoshop and Premiere Elements and a two-year subscription to Norton Internet Security. Got that, guys? Upgrade options include a 256GB SSD and an extra 4GB of RAM, but other than that, what you see is what you get (and to be fair, you get a lot). The Spectre will go on sale in the US on February 8, continuing on to Canada, the UK, Switzerland, Germany, Australia, Japan, Singapore, Chile and Mexico in March. For now, though, head past the break for a walk-through video and some early impressions from yours truly. To be honest, we haven't heard any company refer to a sub-category of "premium Ultrabooks," but we can understand why HP would resort to some defensive marketing. With a starting price of $1,400, HP has got to convince consumers that the Spectre offers a more decadent experience. The least it can do is insist the Spectre is somehow fancier than all the other Ultrabooks crowding the shelves. In fact, HP might have been smarter to just call this what it is: a high-end laptop, and the spiritual successor to the Envy 14. Not an Ultrabook, but a good old fashioned notebook. At 3.97 pounds it's by far the heaviest 13-inch Ultrabook we've seen. Given the weight, price and top-shelf specs, we're more inclined to compare this to the 13-inch MacBook Pro than other so-called Ultrabooks, even if it is missing an optical drive. 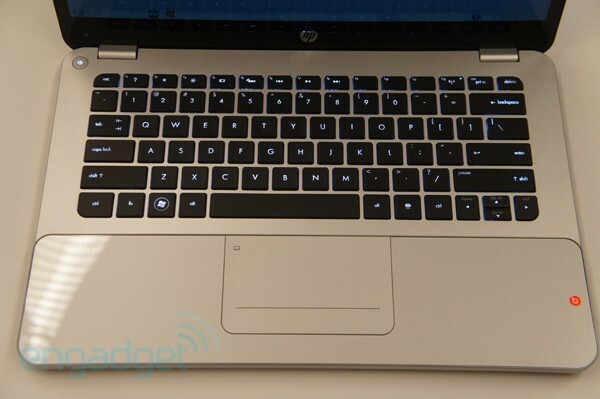 Instead, though, HP is counting on the Spectre's striking design to warrant its steep price. For all intents and purposes, it has the same aesthetic as the Envy 15 and 17, complete (Beats volume dial and all), except its lid is made of scratch-resistant Gorilla Glass. Yes, glass. Though the iPhone 4's shatter-prone backside got us used to the idea of glass phones, this is still an unusual ingredient in laptop construction, outside the display. And HP uses lots of it. On the interior, there's a glass shield reinforcing the palm rest. Much of the chassis is made of glass too, though you wouldn't be able to tell, what with the aluminum exterior. And we have to say: that lid makes quite the impression, particularly with that glowing HP logo in the corner. 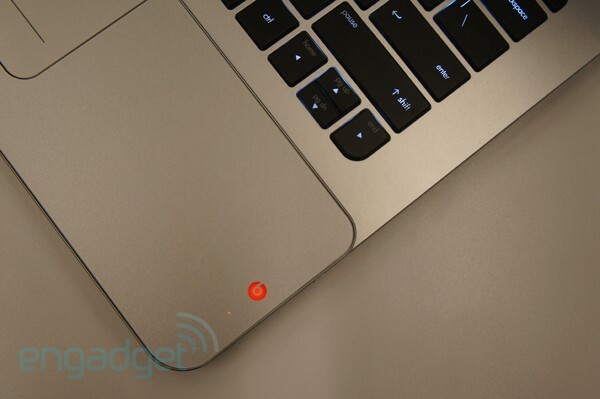 The only real shame here is that as scratch-resistant as the surface might be, it attracts fingerprints on the magnitude of any plastic laptop you've ever handled. We're a little torn on the palm rest, though: we get that it provides protection against the bangles you're probably wearing right now, but it seems to us an unnecessary cluttering of the deck, especially since the glass isn't level with the aluminum adjacent to it. The 1600 x 900 Radiance panel on display here is the same one you'll find in the new Envy 15, and should be a welcome feature for anyone who held off on buying the last-gen Envy 14 after HP reverted to a 1366 x 768 screen. Given the price, the higher pixel density seems warranted, but we're also glad somebody is paying attention to the quality of the display too. Like lots of laptop makers have been doing lately, HP squeezed a 14-inch display (not a Shuriken) into a chassis whose dimensions more closely match a 13-inch laptop, which means the bezels are pretty narrow, and the footprint is relatively compact for a 14-inch notebook. Likewise, the deep blacks, white whites and wide visibility are all refreshing to behold -- even though you'll pay dearly for the privilege of staring at them. 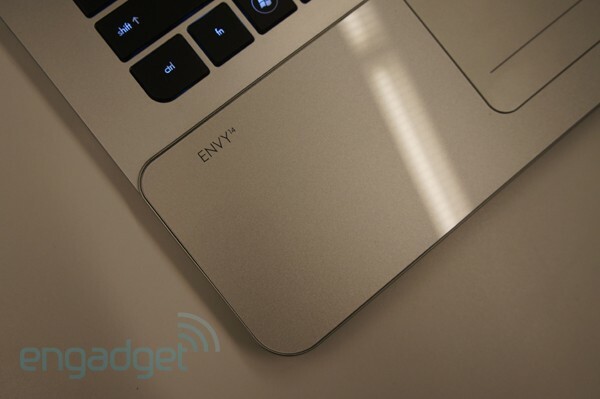 In general, it's hard to go wrong with a backlit keyboard, but the ones we've seen on HP's Envy laptops stand out, as they have a light underneath each individual keycap. The result is a more vibrant glow, which is fine by us as long as it doesn't put a dent in that theoretical nine-hour battery life. We didn't get to see the Spectre's NFC chip in action when we saw the laptop behind closed doors, but we still want to share some additional details about what you can do with this technology, and where it might be headed. For now, you'll need an Android phone with a particular HP app to make use of it, and even then, the only thing you can do is beam URLs from your mobile browser to your desktop one. Based on our conversations with HP, it sounds like the company would like to extend the functionality so that you can transfer other things (business cards, say), but before that can happen, there needs to be a larger ecosystem of software, both on the mobile and PC side. What's remains to be seen is whether HP will actively design apps for its customers, or wait for NFC to catch on and let third-party developers lead the way. There's no question that the Spectre has a unique, if bulky design, and that it's stuffed to the gills with all the high-end specs and marquee features you could want (and also, some gimmicks like NFC, which you might never have asked for). What we don't understand, though, is why HP chose to call this weighty, expensive thing an Ultrabook. It just doesn't seem wise to invite comparisons with machines that are thinner, lighter, promise similar performance and cost hundreds of dollars less. Are all of those extra perks like a 1600 x 900 display, WiDi, Wireless Audio and NFC worth the premium? Or are we better off re-thinking the Spectre entirely and pitting it against more robust laptops, such as the Dell XPS 14z and Sony VAIO SA? We'll let you chew on that until we get one in to review. PALO ALTO, Calif., Jan. 9, 2012 – HP today revealed the HP ENVY 14 Spectre, a premium consumer Ultrabook PC that commands attention with its unparalleled use of glass and stunning performance. "Sleek, midnight black glass on the outside and stark contrast silver glass on the inside make Spectre extraordinary, defying conventional notebook design," said Eric Keshin, senior vice president, Strategy and Marketing, Personal Systems Group, HP. "We chose the name for our first ENVY Ultrabook to evoke mystery, and we packed it with the best in entertainment technology to satisfy those who expect the unexpected." Tough yet beautiful, the HP ENVY 14 Spectre uses lightweight, scratch- resistant glass on the lid, display, palmrest and HP ImagePad – an industry first. A full 14-inch screen inside a 13.3-inch body means customers can get more enjoyment from their entertainment. The HP Spectre's high-definition (HD) HP Radiance Display offers higher resolution, richer color, better brightness and wider viewing angles than traditional notebook displays. Equipped with a matching audio-grade speaker mesh and Beats AudioTM, an exclusive, high-performance technology developed by HP and Beats by Dr. Dre, the HP Spectre boasts an aluminum analog volume dial that acts as a visual design cue and works seamlessly with Beats Audio Manager to precisely adjust audio levels. Built-in HP Wireless Audio turns any home into a concert hall, allowing users to stream uncompressed audio to up to four external devices or directly to any KleerNetTM-compatible device. An HP Radiance Backlit keyboard provides outstanding illumination using individual LEDs dedicated to each keycap. The keyboard works with an advanced proximity sensor to intelligently sense a user's presence, lighting up when a user approaches and dimming down after he or she leaves. The HP Spectre is blazingly fast, stunningly sleek and boasts up to 9 hours of battery life. Powered by the latest Intel® CoreTM processors, the 20-mm-thin HP Spectre weighs less than 4 pounds and includes up to 256 gigabytes (GB) of storage. Intel Rapid Start Technology and support for two ultrafast mSATA solid state drives allow for quick boot and resume times. The HP Spectre also comes loaded with HP exclusives, such as HP CoolSense technology, which automatically adjusts performance and internal fan settings for a noticeably cooler PC. In addition, the HP ImagePad provides precise multifinger touch navigation and the HP TrueVision HD Webcam provides brighter, cleaner HD images. Additionally, the Spectre offers a performance-tuned software image, full versions of Adobe Photoshop® and Premiere Elements, two years of preinstalled NortonTM Internet Security(6) and a concierge phone line for technical support that is dedicated exclusively to HP ENVY users. The HP ENVY 14 Spectre notebook PC is expected to be available in the United States on Feb. 8 with a starting price of $1,399.99. The HP Spectre will also be available in early March in additional countries, including Canada, United Kingdom, Switzerland, Germany, Australia, Japan, Singapore, Chile and Mexico. Additional information is available at www.hp.com/go/spectre or by calling the HP "Reserve Now" line at +1 888 291 7996.